GFWC clubwomen are filling the holidays with music. The Fuquay-Varina Junior Woman’s Club (North Carolina) has a Christmas Social every year that involves getting dinner at a local restaurant and then going back to a member’s house for dessert and coffee. They spend an hour caroling and sharing their memories of youth, led by a professional pianist they hire for the evening. The club enjoys adding special harmonies and tunes to the carols, and have wonderful time singing and storytelling. Many GFWC clubs carol to bring cheer to their communities. In addition to an evening of acapella caroling at their annual Christmas party for their guests to enjoy, the Women’s Club of Farmingdale (New York) continued their annual custom of entertaining the Farmingdale Adult Day Care Center with traditional Christmas tunes! The Swartz Creek Woman’s Club (Michigan) provided a Christmas tree lighting, complete with two live reindeer, and had the high school Madrigals and a local band sing carols. Then they had a huge event called Christmas in the Creek, which was their first ever no-fee event for their community. 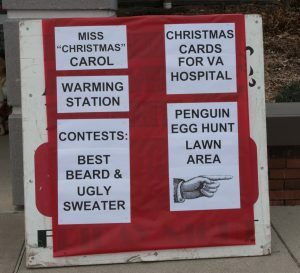 The event was packed with things for kids to see and do, including a penguin egg hunt and a Charlie Brown Christmas skit. 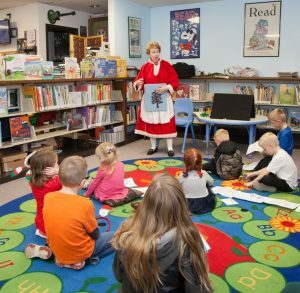 The local library also featured Miss “Christmas” Carol, who read and sang songs to young children! With all of the activities and song, the club made sure their community could find Christmas spirit wherever they turned. 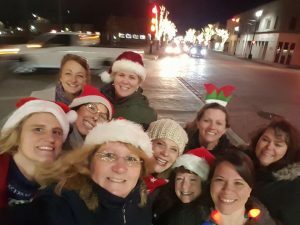 The Oconomowoc Junior Woman’s Club (Wisconsin) braced the wind and cold for their fourth annual tradition of Christmas caroling at local establishments in downtown Oconomowoc. The club uses the evening to raise money for Rogers Memorial Hospital Foundation, which participates in the Give for A Better Day Holiday Gift Drive that benefits the Angel Fund. The Angel Fund gives a gift to children ages 8 through 17 who will be undergoing treatment during the holiday season. Every year, the hospital staff hosts a festive party and distributes gifts to each patient. Oftentimes they are the only holiday gifts they receive. This year the club raised $363.00 for the Angel Fund, and one of the club members will purchase gift cards for the patients so they can have a brighter holiday. 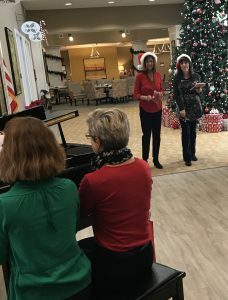 The Woman’s Club of New Tampa (Florida) carolers were right on key when they shared Christmas jingles and joy with the residents at the Legacy at Highwoods Preserve. The residence offers assisted living and memory care for seniors. The club sang and served cookies and warm drinks. The tradition of bringing Christmas cheer to seniors is one of their favorite holiday outings each year. Whether they’re caroling for a cause, or just to bring a smile to everyone’s faces, GFWC carolers are uplifting spirits in their community through song! 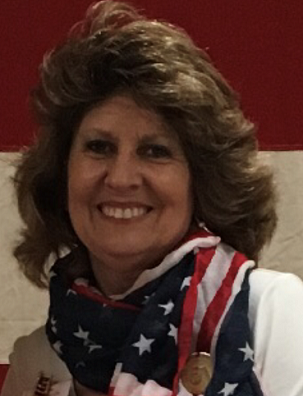 Sharon Oliphant is filled with positive energy and gratitude for all of the opportunities she has to give back because of GFWC. In 2018 she will begin her time as Florida State President, and Sharon is assume the role and work with her enthusiastic Florida clubwomen to make a difference.